1. : A "ḳerobah" for Sabbath ha-Gadol. It is said to include also , found in the Pesaḥ Haggadah. 2. : A "shib'ata" for the seventh day of Pesaḥ. The middle portion is missing. 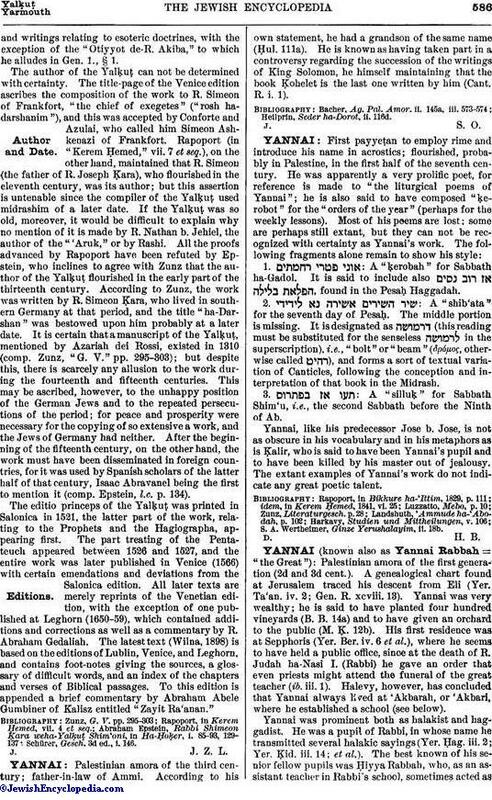 It is designated as (this reading must be substituted for the senseless in the superscription), i.e., "bolt" or "beam" (δρόμος, otherwise called ), and forms a sort of textual variation of Canticles, following the conception and interpretation of that book in the Midrash. 3. : A "silluḳ" for Sabbath Shim'u, i.e., the second Sabbath before the Ninth of Ab. Yannai, like his predecessor Jose b. Jose, is not as obscure in his vocabulary and in his metaphors as is ḳalir, who is said to have been Yannai's pupil and to have been killed by his master out of jealousy. The extant examples of Yannai's work do not indicate any great poetic talent. S. A. Wertheimer, Ginze Yerushalayim, ii. 18b.